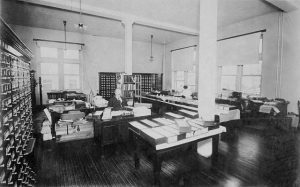 An office in the Dominion Archives of Canada, circa 1910. Source: Library and Archives Canada, , C-034009. This theme week, edited by Krista McCracken, was created as a way to encourage a conversation between archivists and historians. Historians and archivists often have overlapping and similar concerns. However they are two distinct professions which would be well served by communicating openly about their work. All of the posts in the series were written by practicing archivists. It initially ran in June 2017.